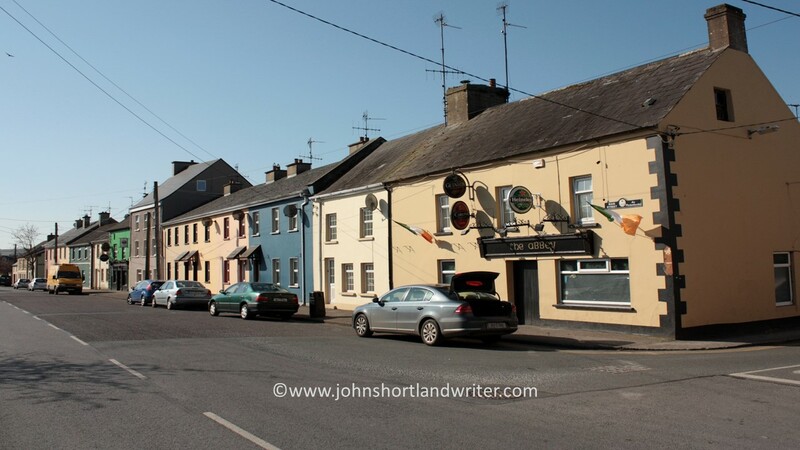 The small village of Castlelyons in Co. Cork, Ireland appeared deserted when we drove into it and as we seemed to be the only car on the road there was no fear of being run over when taking the photo below. As if to confirm its silence the main street was dominated by the ruins of an old Carmelite abbey. 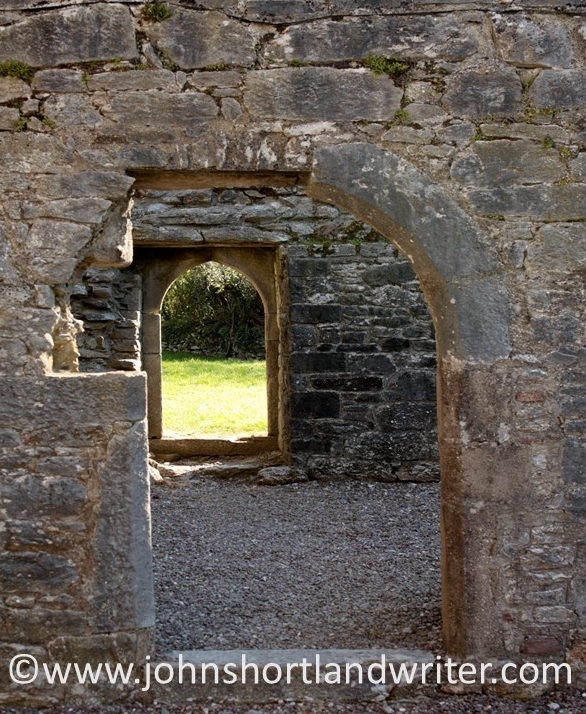 Little is known of the origins of the abbey for there are few surviving written records. It is thought that it dates from the beginning of the 14th century although the existing ruins are from a hundred years later. The size of the nave is huge measuring over sixty feet in length and twenty in width. It is separated from the chancel by the tower which although very ruined still has its complete spiral staircase which can be climbed – but not for the faint-hearted. 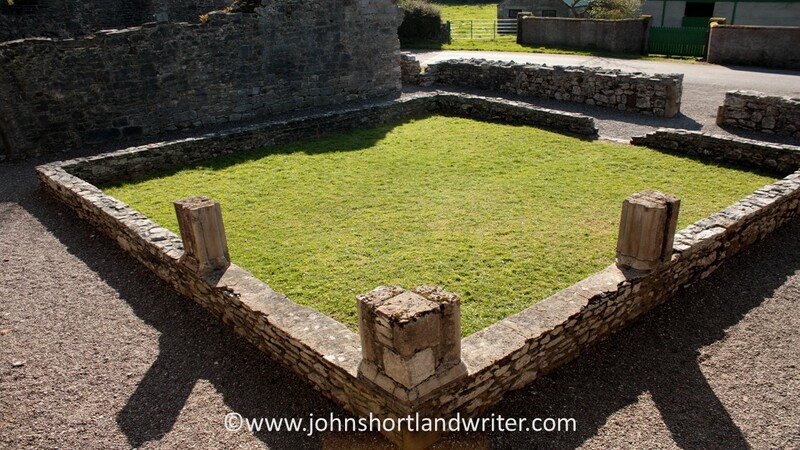 The chancel which is also very large (over fifty feet in length) is where the altar would have been placed. 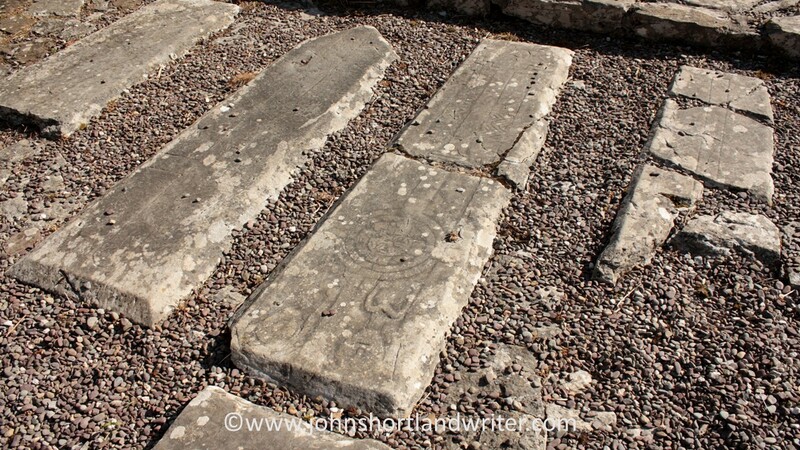 A number of grave slabs survive some of which still have visible markings. The cloister, where the monks walked and meditated, is less complete but the turf square and parts of columns gives a sense of the place. The monastery was dissolved during the Reformation and passed into private hands. Now it is a national monument. 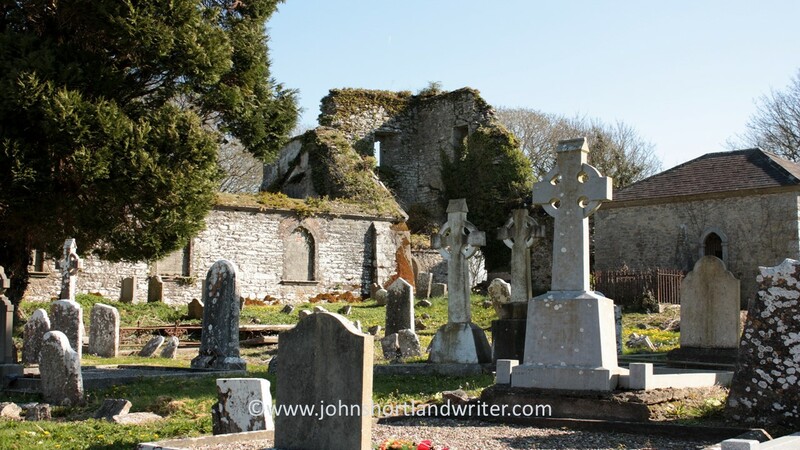 A mile or two from the abbey ruins is the Castlelyons Graveyard at Kill-St-Anne. 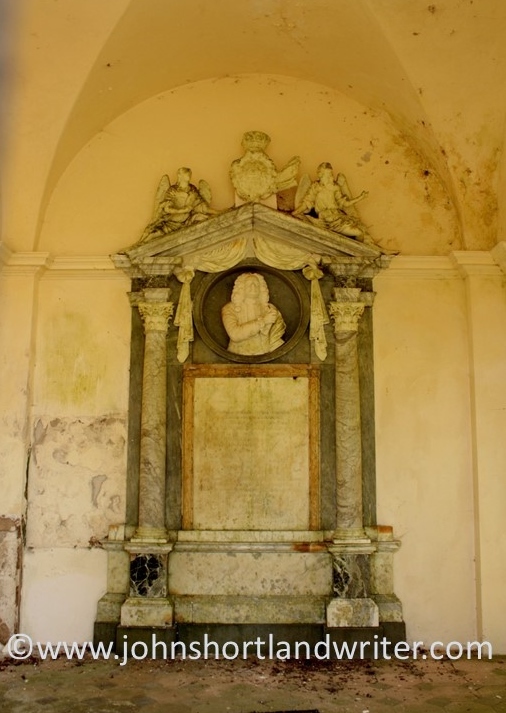 At its centre is a mausoleum built about 1747. 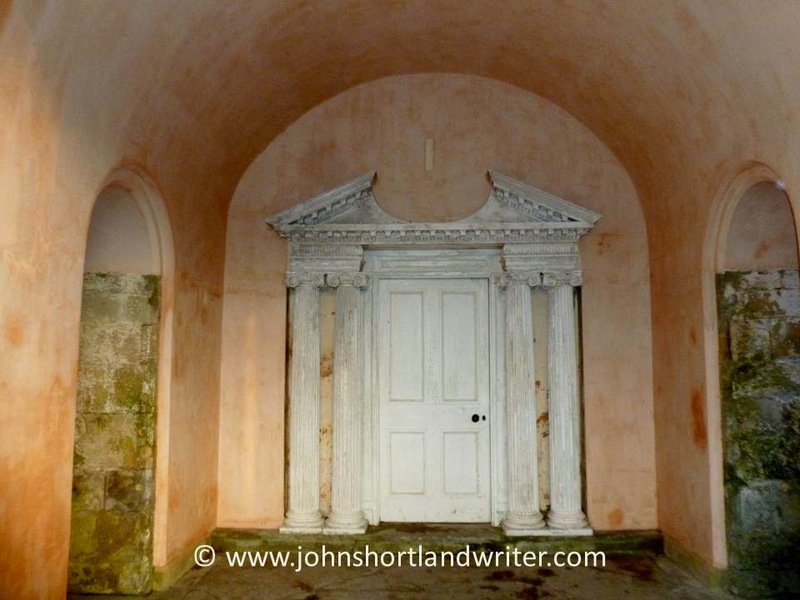 The interior is circular with just one marble monument to James Barry, Earl of Barrymore and carved in 1753. 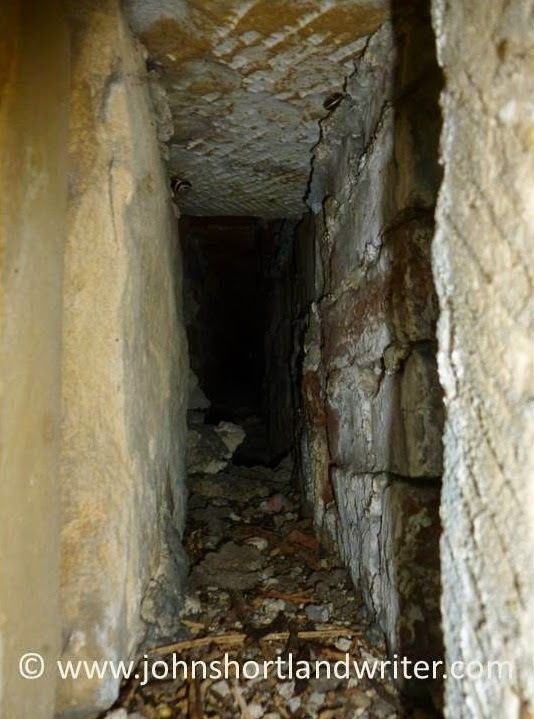 External steps lead to a crypt below. Close to the first lies a second mausoleum, also built in the eighteenth century, for the Peard family, local landlords. Their earliest grave (dated 1683) lies elsewhere in the churchyard and commemorates Richard Peard, an ensign from Devonshire in England. 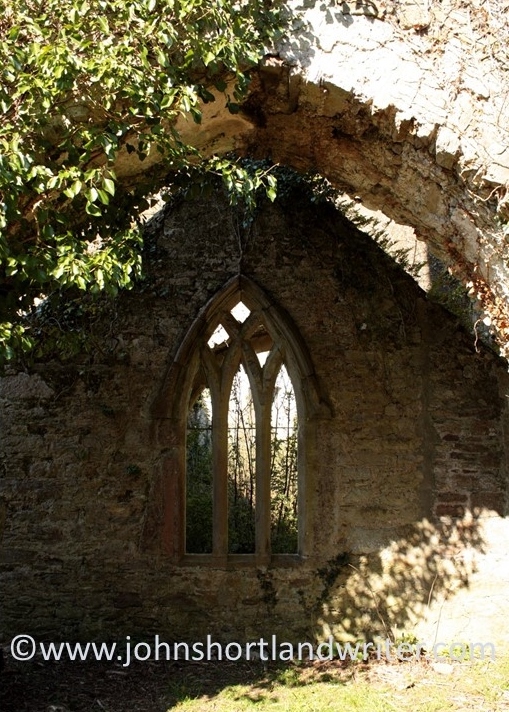 The church – or more accurately churches – lie in ruins for a more recent one was built within the original. They date from the eighteenth and fourteenth centuries respectively. The remains of the bell tower and gothic arches are from the earlier date, the elaborate stone window which are in the later ruins are reputed to have belonged to the original church. Whatever the truth of this tale, the result is beautiful and romantic. 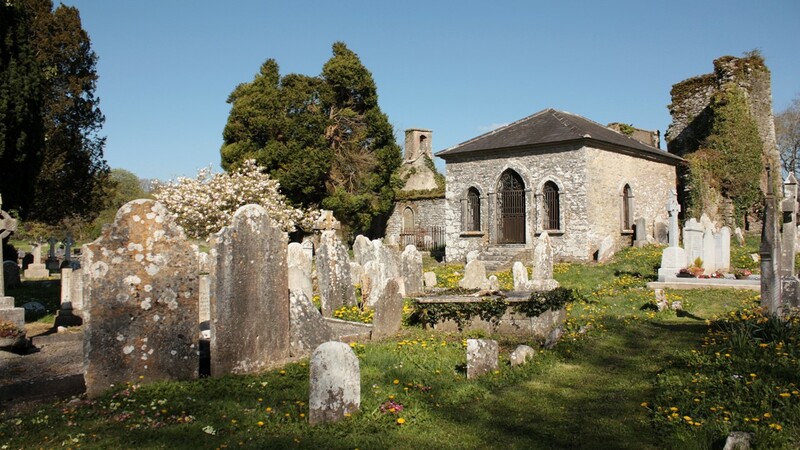 The churchyard is a haven for wildlife and native flowers flourish beside mown paths. Beside the old cemetery is another, newer one still in use and equally well-maintained as were the old abbey ruins and the village itself. 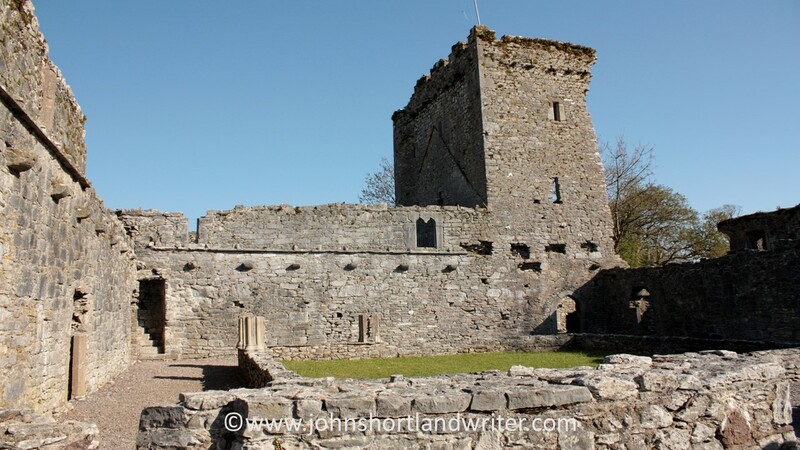 Castlelyons maybe off the beaten track but it is well worth making the effort to visit. It is rural Ireland at its very best. 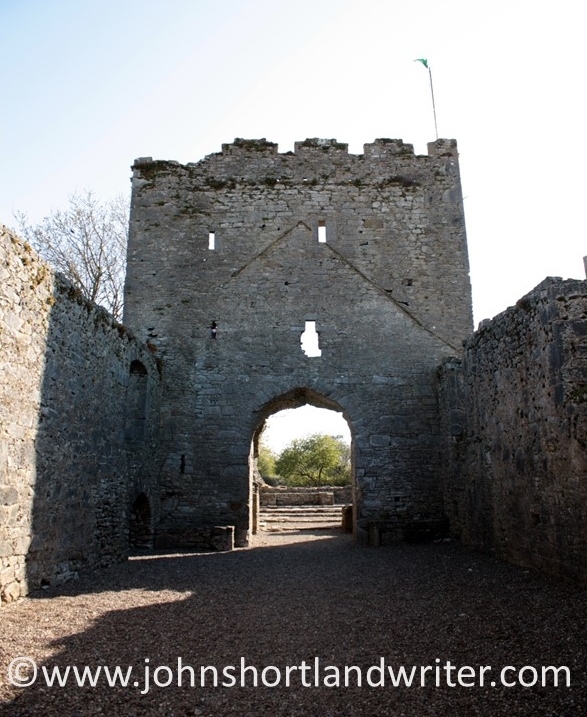 Much information has been gleaned from information boards within the village and also the Castlelyons village website – link here. Apart from details of its history the website shows that despite its small size, the village social life is thriving. 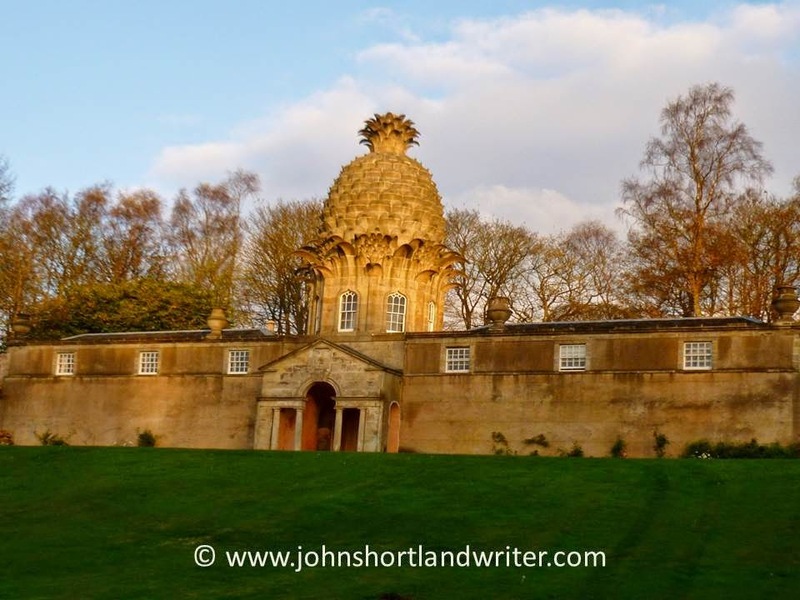 The statement “I have been living in a Pineapple” may give cause for surprise but is, in fact, quite true for I have just returned from a brief trip to Scotland. To stay in a building that puts a smile on your face whenever you catch a glimpse of it ought to be on everyone’s ‘to do’ list – if it is, The Pineapple is the place to go. 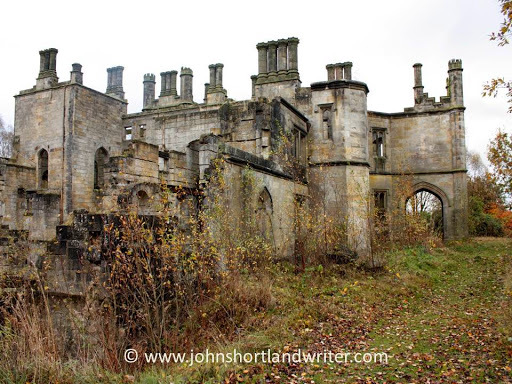 Originally part of the Dunsmore Estate, it was gifted to the National Trust for Scotland in 1974 and leased to the Landmark Trust who undertook its restoration. 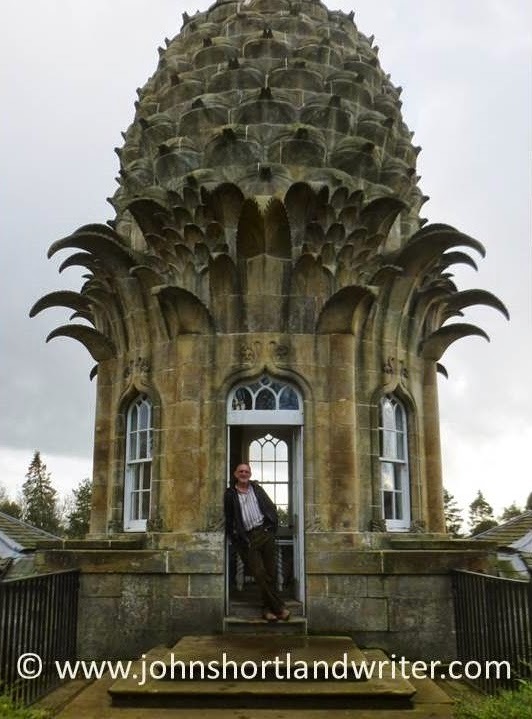 Neglected for very many years, the Pineapple proved to be in remarkably good condition for every ‘leaf’ was designed to prevent water collecting within it and damaging the stonework. 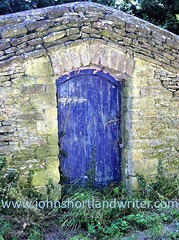 The remainder of the property was very unstable and derelict. 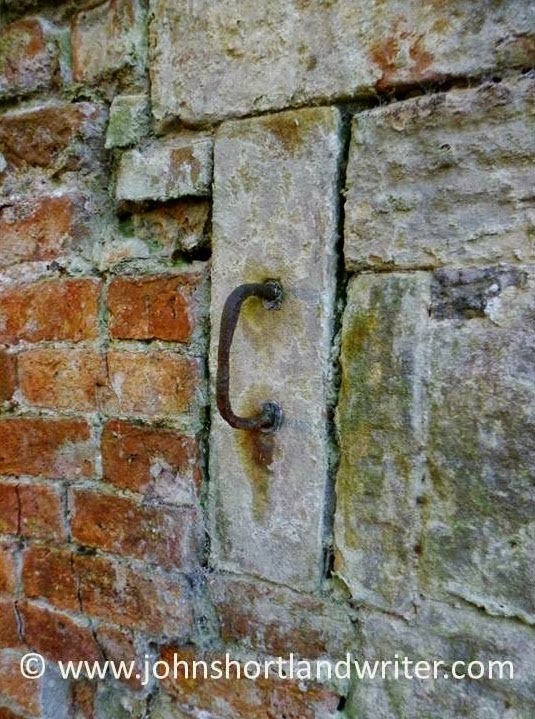 When the two walled gardens were enclosed at Dunsmore in the mid 1700’s there was no ‘big house’ attached. They were purely used for producing a supply of fruit, vegetables and flowers to be sent to the Earl of Dunmore’s home in Argyll. 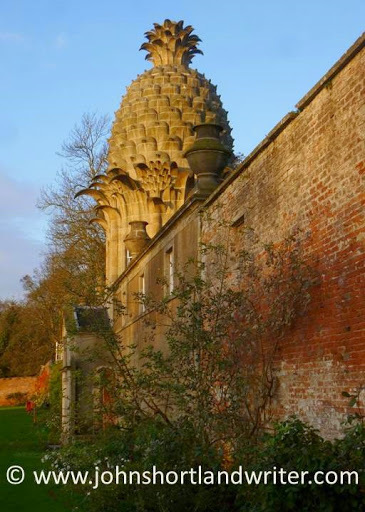 It was some years later (it is thought) that the Pineapple was added as a folly and summerhouse, probably after the Earl’s return from Virginia and the Bahamas where he was Governor. Why a pineapple? In the eighteenth century, pineapples were a rare luxury that had become associated with wealth and hospitality. 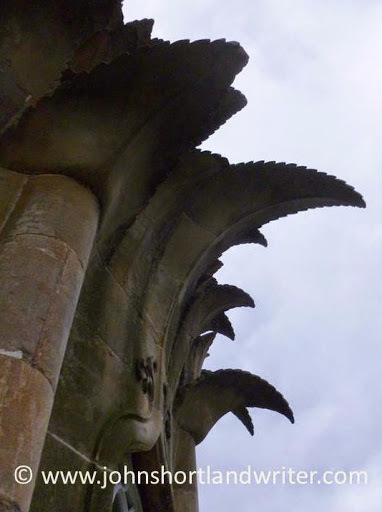 They began to appear on pillars, railings and weather vanes and, indoors on fabrics and wall coverings. 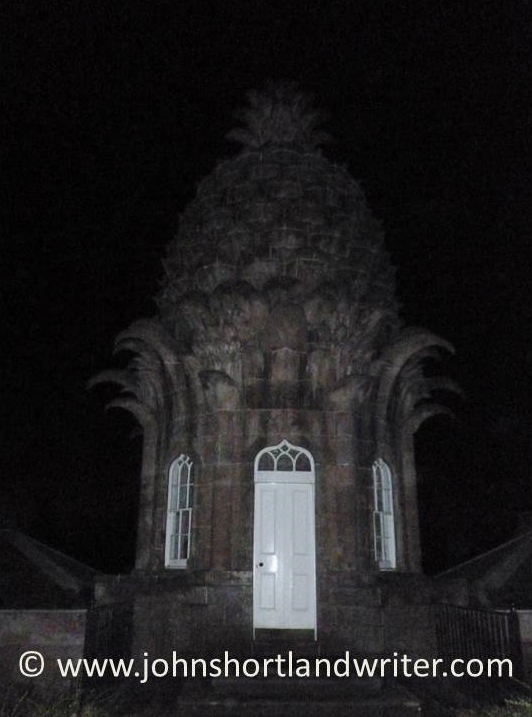 The building of The Pineapple was, perhaps, the grandest of all grand gestures. Although the building is of such high quality in both its materials, cratsmanship and design it was barely recorded in contemporary writing and its designer remains unknown. One possible reason for this is that it may have been just a little too ‘over the top’ even for flamboyant Georgian taste. It is even quite probable that the Pineapple may have been painted. The doorway of the undercroft is a very accurate timber carving of Ionic pillars beyond which stone steps lead to the raised northern lawn. From this lawn there is level access to the summerhouse. Either side of the Pineapple are two small cottages, formerly gardener’s bothys. These have been fully restored by the Landmark Trust to create holiday accomodation with living room and kitchen in one and bedrooms in the other. The north garden and the Pineapple room are for the private use of guests, the south lawn and gardens are open to the public. To be able to grow pineapples required specialist knowledge and skills as well as additional warmth. 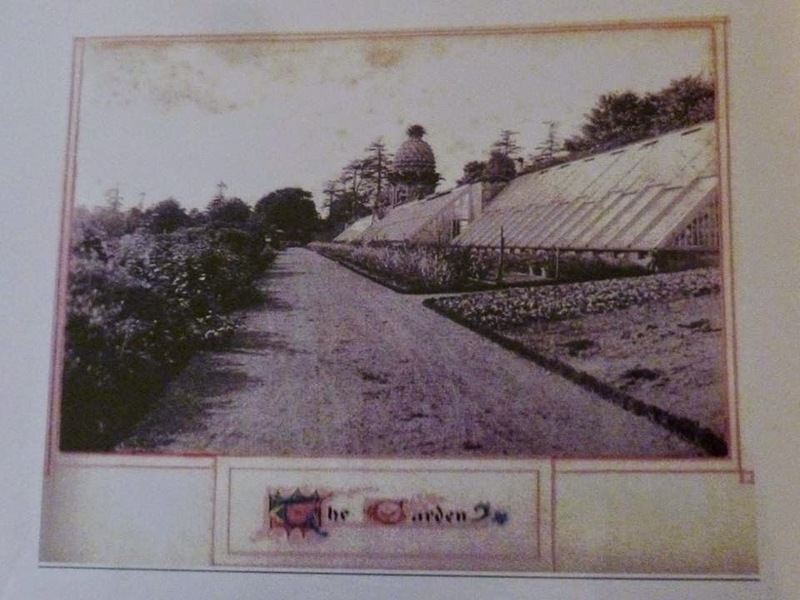 Glasshouses flanked the south wall and were heated by the use of specially constructed hollow walls. At the foot of these, fires were lit and flues within the wall drew the heat upwards, warming the brickwork. 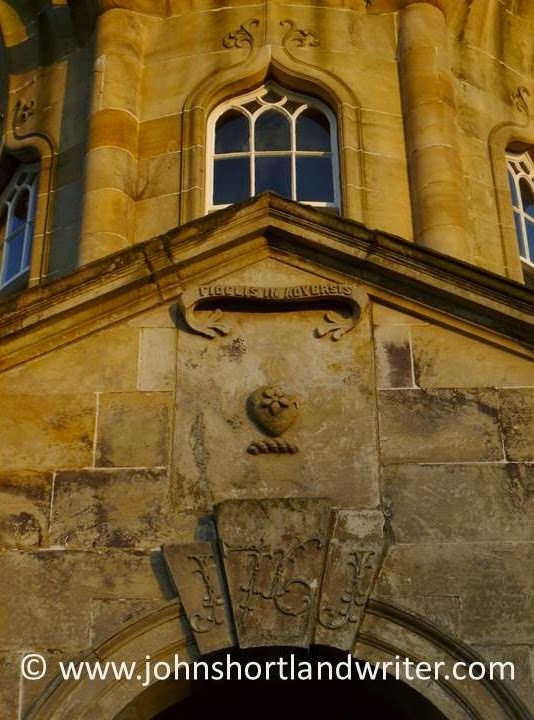 The four decorative urns to either side of the Pineapple conceal chimneys and because of there similarity to those at Casino Marino in Dublin (to read about this extraordinary building click here), it has been suggested that the designer could be Sir William Chambers although there is no documented evidence to suggest this. At intervals on the southern side of the walls I found sliding stones which could be removed presumably to allow the heat to escape. In 1820 William Wilkins, architect of the National Gallery in London, designed a house in the Tudor Gothick style. Dunsmore Park’s glory was, however, short-lived for by 1911 the family had left although it remained occupied until 1964 after which it was abandoned. It is now a ruin visible across the fields from the Pineapple. 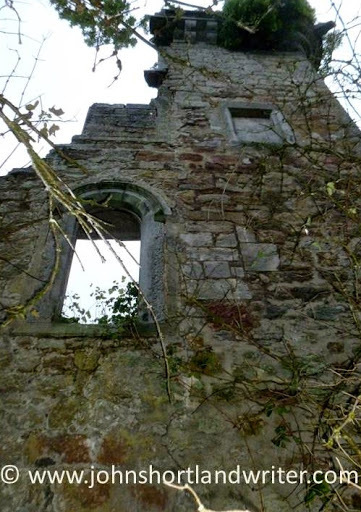 Another ruin, now very unstable, and also visible from the Pineapple, is the Elphinstone Tower. 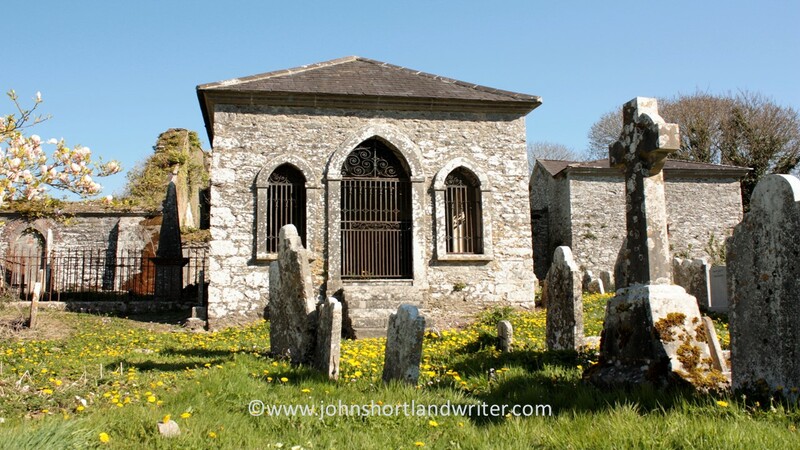 Of earlier origin, built about 1510, it became the family vault of the Dunmore family in 1836 with a church built alongside a few years later. This was demolished in the 1960’s. 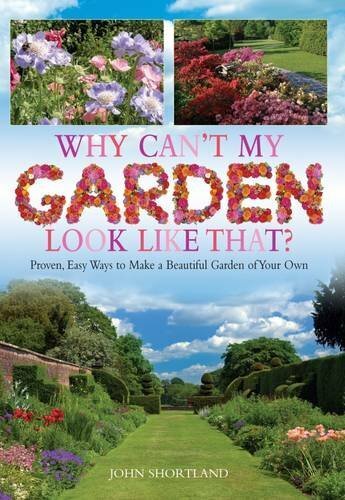 Their fascinating stories will be subjects of this blog in due course. With so much history and beautiful scenery close by – Loch Lomond is only a short drive away – the Pineapple makes a great and intriguing place to use as a base for exploring the area. The grounds are open free to the public all year but the building is at its best during the hours when you are alone to enjoy its eccentricity and splendid isolation.